I really want something in 308 and looking for something a little difrent than a AR 10. Every thing I read says if there is a choice then a FAL is the answer, but the nice thing about the PTR is it already comes with a scope rail and for the same price as the FAL I can get a million aluminum mags. Best I can tell both are dead nuts reliable, and both can shoot around 3 Moa with decent ammo. I am left handed if that makes a difference. What should I do? Am I being dumb and should just go with some type of AR 10? I'd go with the Fal - very mild recoil. You might also look at being a used gun on the Fal Files as DSA quality control is not great. I own a PTR-91 and have shot my father's HK-91 extensively - I have never had a function problem with either of them but they don't hold a candle to my Imbel Fal as far as being enjoyable to shoot. I've shot both, have owned a couple FAL's, go with the FAL. A railed dust cover is only about 75.00 from DSA, IIRC. I greatly prefer the FAL over the 91 too. No, my name is not a reference to enemas. I sold my Portuguese (FMP) G3 to fund another FAL. Set the gas for the load you're shooting and it's a treat, even with the paras and their tube stocks. G3 not so much. Who owns your mind's control? I have a PTR on the way and an FAL build in-progress, with my eyes also set on a DSA Para in the near future. If you are only looking to pick up one, then the FAL. Of course, this being Arfcom, "get both" is the correct answer. Hatred of the state is love of humanity. Don't be a tier queer. I favor the G3 over the FAL. I'd get one of the new PTR's with a paddle mag release. It is true they have sharper recoil, but a heavy buffer and HK21 recoil pad will help, if it bothers you. I've fired them full auto in standard config and it's not that bad. A different locking plate will also help to attenuate the recoil impulse. That said, there are not many .30 caliber rifles that shoot as softly as the FAL. The FAL allows you to dial down the gas; the locking piece on an HK will also allow you to tune the rifle somewhat. Plenty of adjustable gas blocks for AR308s. And really nice triggers. And stocks that dont require risers and pads to use any number of good optics mounts. Optics which you'll need, because of how much more accurate the rifle is than those 1940's battle rifles. The AR's and SCAR 17 are the best, but yes they do cost more. I think you'd still be well under the cost of a JP after upgrading an Armalite. Have you looked into a build utililizing the MA-TEN? The FAL is the softest shooting .308 I have ever owned. They are a pleasure to shoot, period. Grabbed a 200 round battlepack and went to the range this morning before work to confirm the zero on my Imbel. Only meant to shoot a few rounds and then head to work. Said screw it, called work and told them I wouldn't be in today, and ran through the entire battlepack. Way too much fun. Nice! Beautiful day today as well! I am deciding between a 5.45 AK or a FAL as my next gun. FAL beats the snot out of an AK in every category but ammo cost. weight, mag capacity, length . . .
AK's aren't known for vertical stringing either. No experience with the Scar. 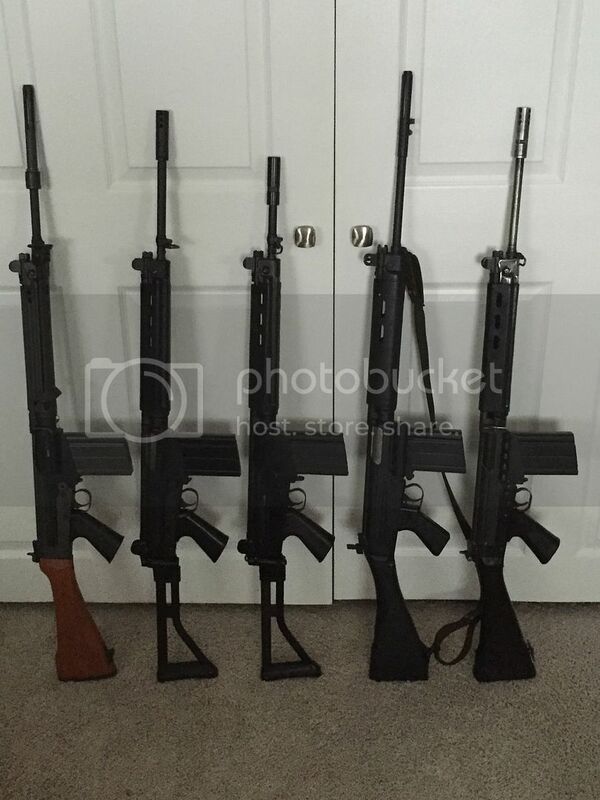 My .308 experience is with the FAL, AK, PTR, and bolt guns. Both are great rifles. I lean more toward the HK91/PTR but the FALS are great as well.